What you write above your post is just as important as what you write below in your post. You can’t help yourself, you find yourself reaching for the magazine in hopes that, yes, you, too, can get what the headline promises. That’s the power of a good title. It’s a magnet that draws in your audience. If you write a stellar post, and you’d like to showcase it, then you just have to title it that way. There are so many opportunities for your post title to be seen, might as well make it a good one. Let’s say you have posted what you feel is your best humor piece ev-er, regarding your threadbare yoga pants that have finally bitten the dust. You’ve worked on it, it shines, it makes you laugh every single time you have re-read it before finally pushing “Publish.” You want the world to laugh with you, it’s just so good. But, how do you get people to see it? Twitter will show your post title, so will your Facebook page. Search Engines will pick up your post title keywords: someone will google “Yoga Pants” and Voila! arrive at your doorstep, and returning again if they like what they find at your blog. Post titles are displayed on your own blog, under “my favorite posts.” A good post title will work that way, it will draw people to come to your blog, and want to meet you. Of course, you still have to deliver. We all know the mantra, "content is king. content is king. content is king..." (sorry, fell into my ohmmmm moment there...). So, let's take time with our post title, let's be creative: try switching the order of the words around. Take the few extra minutes required to think of something unique and enticing. We can call a post “Heritage.com Says I Look Like A Man” or “Ashton Kutcher is My Twin.” Now, wouldn’t you be powerless and click over to find out more based on that promise of information of how a blogger you know is related to Ashton? I know I would. Wait, both would work for me...I'm easy like that. Thanks for the advice! I'm gonna try it out and see what happens. I always mess around with my titles to the point where sometimes I forget what the entire post is about and then go re-read it and then spend, like, 12 hours DYING because, let's face it, I'm hilarious. I was trying to remember where I read it before- glad you said that at the end! Okay, I know everyone has gotten a kick out of that article, but it was a really embarrassing time for me and the sumo suit seemed like a good idea at the time. ok, so you're telling me that i need to THINK about what I write?? That sounds hard. So true, and something I need to remember more often! What do you think, should I title every post "See me naked"? But titles are soooo exhausting and I'm sooo lazy? I love coming up with my titles. Being a reader of blogs long before deciding to write my own, I was well aware of the importance of a good hook. I strive for vaguely vague. Of course my last post is not my best example, but usually my title is one of my favorite pieces. All I can think about is how much I want a Snickers right now! 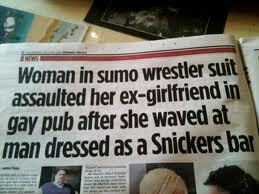 My newspaper never let's me run fun headlines like that. Probably because I am a society columnist, and that might be weird. But I'm terrible at headlines/titles so this had awesome points and was a great reminder. Yes, yes. Titles are crucial. I pick up a book often because of the title. If only I could write good titles. This is not my strong point. But I'm working on it! Your title is great!!! nice....titles are hugely important....and as long as you can back it with good writing you are fine...smiles. A good title always calls to me. Especially when I'm looking for new blogs to read. I'm sorry, but I'm still cracking up over the Ashton is your Twin post. That is so dang wrong and that's why it's so funny!! And it is not true in the least. Oh my gosh, I'm cracking up here. You DO look like that picture of Ashton Kutcher!!!! That is so true! I struggle with this one at times. I like your old stuff! Good post.. I probably "fret" more over the title than the post. I think I would have called it, "Gandhi Wore More Than This." I put thought into my titles (as in "hmmmm...does this sound clever and witty?") but hadn't considered the search engine/Twitter/mass media angle. I will in the future. Thanks, Empress. Post titles were the hardest thing ever for me when I started blogging! That's a great post! The problem i have is that all my titles start with in which...maybe i shouldn't have started that but i did. hmmm..food for thought. Exploding yoga pants = someone did not observe the no eating 2 hours before class. Sometimes crafting the title is my favorite part! You are so right, and I need to work on this for sure. Titles are a definite weak spot of mine. I struggle with titles more than any other part of the writing process. You have given me something to think about! I should think more about my titles. Usually by the time I'm ready to hit send at 1:30 am I can't think anymore and they get the least amount of attention. I will heed your words of wisdom and make up some doozies. In fact I'm going to change the title of today's post right this minute! You? Are all sorts of awesome. Love that you want to help us...ok me who is new to blogging...instead of creating this "competition" air that surrounds some other blogs. Love you and have mad respect for you Empress. Mad respect. I remember this post from the first time. It's a good one. Oh, I'm so behind...I'm trying to write a YA book that I need to finish by the end of the month. I'm sorry I'm missing so many wonderful posts. But I love this. It truly made me think and laugh. I've missed reading you. Off to check your other posts.